Tax experts have warned that the new 3.8% Medicare surtax--which applies to "net investment income" (NII)--can be a formidable tax obstacle for upper-income investors. 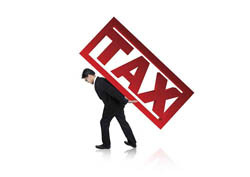 But the NII tax isn't just a concern for individual taxpayers. It also may affect trusts and estates. In fact, the overall impact on estates and trusts with substantial annual income might be even greater than the tax sting felt by wealthy individuals. First, let's review the basic rules. For 2013 and thereafter, you must pay the 3.8% Medicare surtax on the lesser of your NII or your modified adjusted gross income (MAGI) above an annual threshold—$200,000 for single filers and $250,000 for joint filers. For this purpose, NII is defined to include interest, dividends, capital gains, rents, royalties, nonqualified annuities, income from passive activities, and income from trading financial instruments or commodities. However, certain items—such as wages, self-employment income, Social Security benefits, tax-exempt interest, operating income from a non-passive business, and distributions from IRA and qualified retirement plans—are excluded from the definition of NII. But the 3.8% Medicare surtax also applies to trusts and estates. In this case, the dollar threshold for single or joint filers is replaced by the dollar figure that begins the top tax rate for trusts and estates. For example, if all of the trust income is NII and the undistributed net investment income exceeds the dollar threshold by $10,000, the trust must pay a Medicare surtax of $380 (3.8% of $10,000). As you might imagine, the tax cost can become pretty steep for a trust with an annual income of five figures or higher. Going back to our previous example, if the trust's NII exceeds the upper limit of the top tax bracket by $100,000, the surtax amounts to $3,800 (3.8% of $100,000), on top of the regular income tax. What can you do about it? Depending on the terms of the trust, you might be able to arrange for distributions to family members in lower tax brackets during years when the 3.8% surtax is minimal or nonexistent for the trust. For example, suppose that you've established a trust to pay for a grandchild's college education and the grandchild is currently in the 10% tax bracket. By paying out distributions over several years while the grandchild is still in the 10% bracket, you might sidestep a hefty NII surtax on the trust when he or she is ready to enter school. Of course, there are other factors to consider, so this strategy isn't for everyone. But don't ignore the potential tax erosion for a trust if it continues to pile up investment earnings.